Leave it to the folks at MIT to design a foldable, stackable, light weight, electric car that can go up to 55 mph with a potential in the future of hitting 100MPH ...only glitch is, in the plan - as cool as it sounds - you don't actually own it...welcome to the future of transportation. Franco Vairani, a Ph.D. candidate at MIT is one of the folks behind "City Car Project" which is touted as one of the Best Inventions of the Year by Time Magazine. 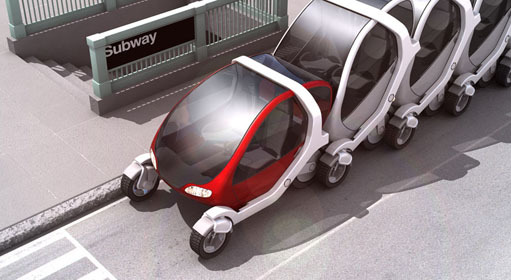 The two seater was designed to improve on city congestion and make parking problems obsolete while treating the environment with green gloves. Vairani explained that it is a robotic unit with electric motors built into each wheel, along with mechanisms for steering, braking and the suspension. "Inside the wheel, we pack pretty much everything needed to move a car. The car has four of these wheels, and that's what drives the vehicle forward. The car doesn't have an engine. There are no gears. No transmission. This is a very efficient way of using energy." 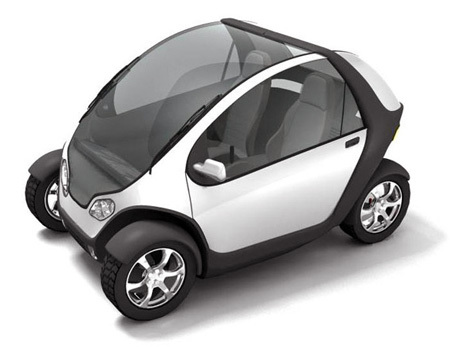 The vehicle is intended to be driven, then dropped off and folded - awaiting the next "user;" creating a rental model for autos. Most amazing is that the vehicle can be folded in such a fashion that eight cars can stack in a single spot. Although the concept is exciting, and has gotten its share of nods, there is no manufacturer to date that has stepped up to make this resourceful, earth friendly concept a reality. A brilliant idea is one that can be implemented - this one clearly cannot. It's more or less a drive-your-own taxi, but with a deathtrap to ride in and no one to handle the "stacks" it makes little sense. What else but an impractical idea would come from MIT? The devil is in the details, and this idea hasn't even begun to make practical sense. There are many ideas that are practical and are fully thought out that are simply stupid - brilliance is not defined by practicality - rather by the innovative quality, the "fresh factor" This clearly was not designed to be a take to market idea, but like all concept cars..to point to what's possible. If this were combined with solar panels to charge the car FOR FREE, it would be practical and money saving in the long run. Make the electric motors cheap and replaceable, and make the car cheap to buy, out of recycled materials.